Massive photo, I know, but...I think my holo tree deserves it! The rest of the photos will be normal size, I promise. The skeleton needed a closeup. Unfortunately the only skeleton image on any of my stamping plates was too big for this and wasn't cooperating, so my nails only have dots and snowflakes. I used OPI This Gown Needs A Crown as the background and topped it with L.A. 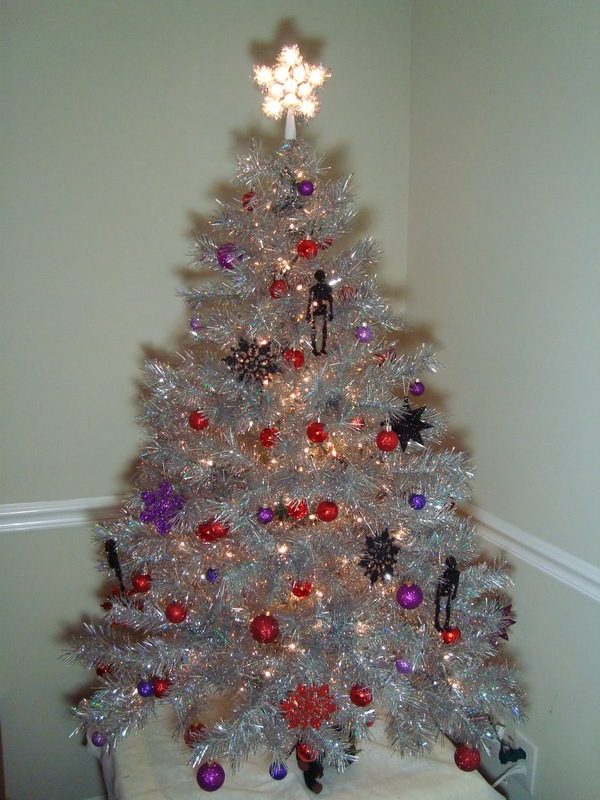 Girls 3D Silver to match the tree. The dots are Sinful Colors Purple Heart, China Glaze Put A Bow On It, and Kleancolor Bite Me. 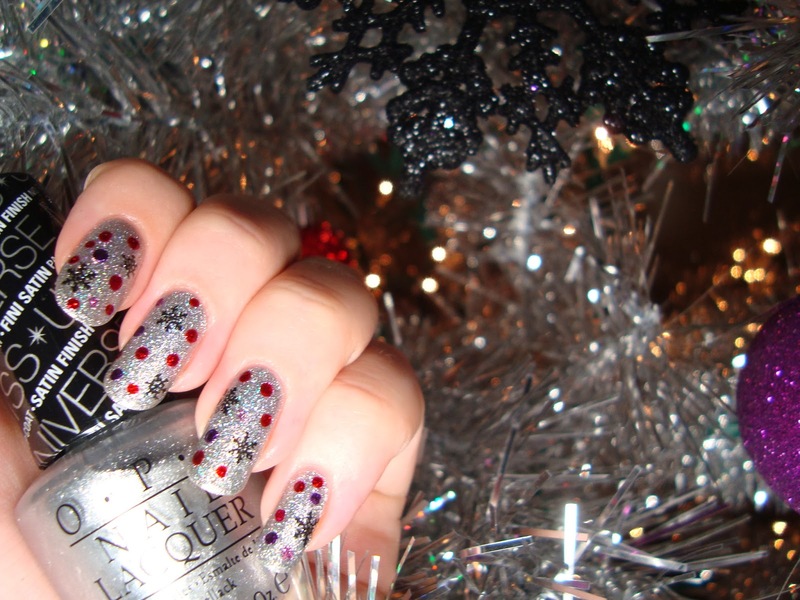 The snowflakes are Kleancolor Metallic Black and Born Pretty Store's QA58 plate. I bought it back in the summer when I ordered three of their holo polishes. I got it for general winter stamping, but as xmas got closer, something went *ding* in my head and this mani had to happen. I'm actually kinda stunned that one of the QA58 snowflakes is almost exactly the same shape as my snowflake ornaments. Too perfect! 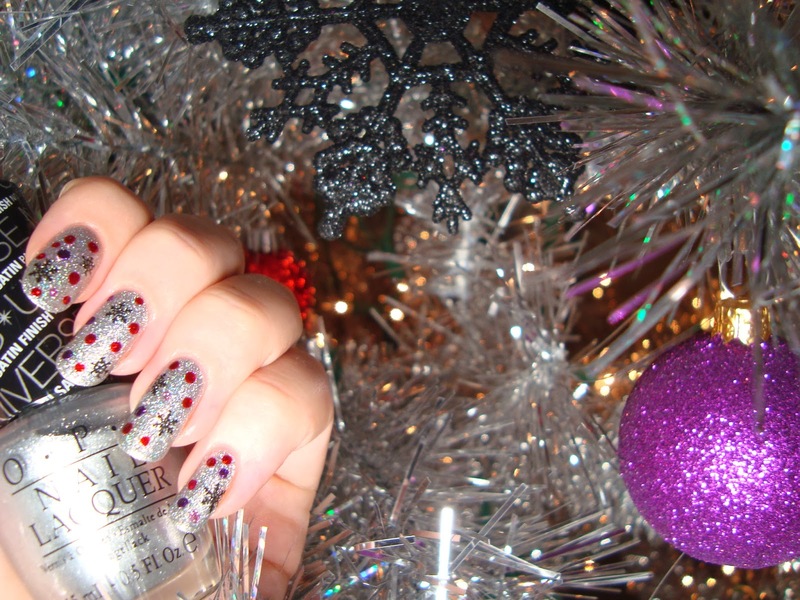 I was almost tempted to skip the dots and just leave it as snowflakes on silver. I might have to do something like this again. This plate is perfection! You can also see the holo bits better when they're not surrounded by dots. Still, it wouldn't match the tree if it didn't have ornaments. One more photo because I love my weird tree! I lied. We need a photo of the tree itself, right? I can't believe it's less than two weeks until xmas!! It really snuck up this year, didn't it?